Post #16 of #49 – Over the next 24 hours I will be raising funds for the Union Gospel Mission during Blogathon 2009 by writing a blog post every 30 minutes. Please consider donating to my cause to keep my going until 6am PT July 26th. Lunchtime here at Blogathon Vancouver. 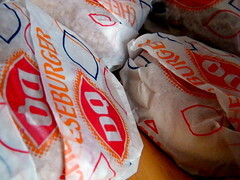 Dairy Queen was kind enough to bring some burgers, wraps, salads, onion rings, fries, sundaes and Blizzards. 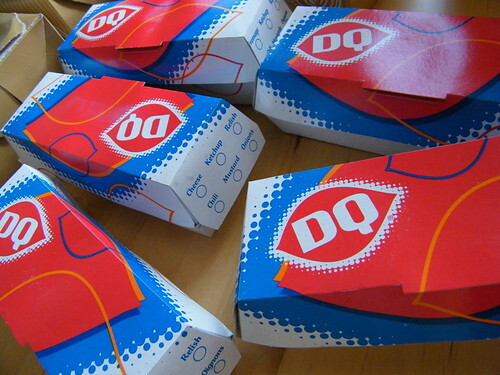 Most of these items are a part of DQâ€™s Sweet Deals menu. 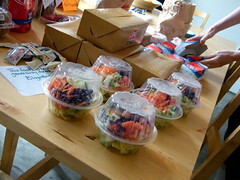 It’s a ton of food but the group here has certainly worked up an appetite as we near the half way point for Blogathon. When we were mere young’uns and our folks took us to the doctor, we would always pass by the DQ at the corner of Main and 14th in Vancouver. Oh, how my sister and I tried to cajole our parents into getting us the DQ soft-serve!